June 2016 | New Creation Inc. 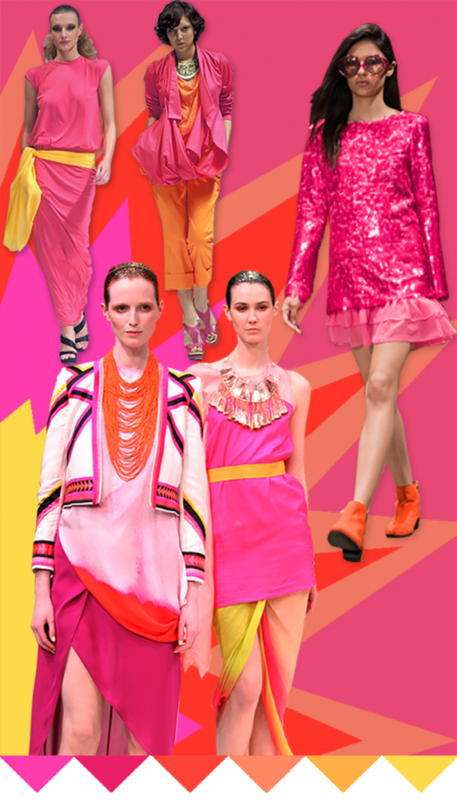 If summer wasn’t warm enough for you already, you can turn up the heat with these hot pinks and pop colors currently trending for Resort 2016. What girl doesn’t love a little pink? Especially when it’s paired with bright yellow, coral, or orange accessories. These highly energetic color combinations are the perfect way to make a splash on vacation or brighten up any night out on the town. At New Creation we begin with detailed trend forecasting for all of our clients. Once we’ve determined what is going to be important for the coming seasons, we work with you to create one-of-a-kind designs that reflect your brand and most importantly keep you competitive in today’s fashion world. Contact us to learn more! Myer Spring Summer Launch 2011 by Eva Rinaldi via Flickr -background of image has been cut out. Shared via the Creative Commons (Attribution-ShareAlike 2.0) license. ALAN ZEPEDA (8) by by DCHIC via Flickr -background of image has been cut out. Shared via the Creative Commons (Attribution-ShareAlike 2.0) license. GST_1706.jpg by Gabriel Saldana via Flickr -background of image has been cut out. Shared via the Creative Commons (Attribution-ShareAlike 2.0) license. COCOLAT-147 by DCHIC via Flickr -background of image has been cut out. Shared via the Creative Commons (Attribution-ShareAlike 2.0) license.